In primary schools across the United Kingdom, teachers are often tasked with teaching health education or physical education, despite lacking specialist training. 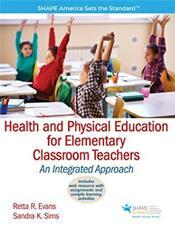 Health and Physical Education for Elementary Classroom Teachers is the perfect resource for these teachers. It covers both health and physical education while giving current and student teachers the skills to deliver appropriate lessons to their young students. It provides everything teachers need in order to incorporate health education and physical education into an integrated curriculum. The text also features lab exercises that allow students to practice the material they are learning, including designing their own standards-based lesson plans.